A police officer, a pastor, a rehabilitation counsellor, and a producer of medical cannabis are set to participate in a panel discussion at Canadian Mennonite University (CMU) exploring the implications of legalizing marijuana. Titled, “Our Need for Weed? Sparking Conversations in the Church and Community,” the discussion will take place Wednesday, November 15 at 7:00 PM in Marpeck Commons (2299 Grant Ave.). Admission is free, and everyone is welcome to attend. Canada’s federal government is committed to implementing the legalized production, sale, and recreational consumption of marijuana by July 1, 2018. “CMU is inviting people to join a conversation that broadens awareness, explores questions, and discerns ways forward as churches and communities confront this new reality,” says Terry Schellenberg, Vice President External at CMU. Can we understand more clearly the government’s full intention and the implications that arise with legalization versus decriminalization? What medical realities do we need to understand about cannabis use? Can the church be a place for real conversation about this issue? What are our fears? What questions, theological and otherwise, should Christians and the church be asking? Nelson Martens, member representative and business developer at Bonify, a licensed producer of medical cannabis located in Winnipeg. Dr. Chris Huebner, Associate Professor of Theology and Philosophy at CMU, will moderate the 90-minute event, which will include opportunities for questions and comments from the audience. 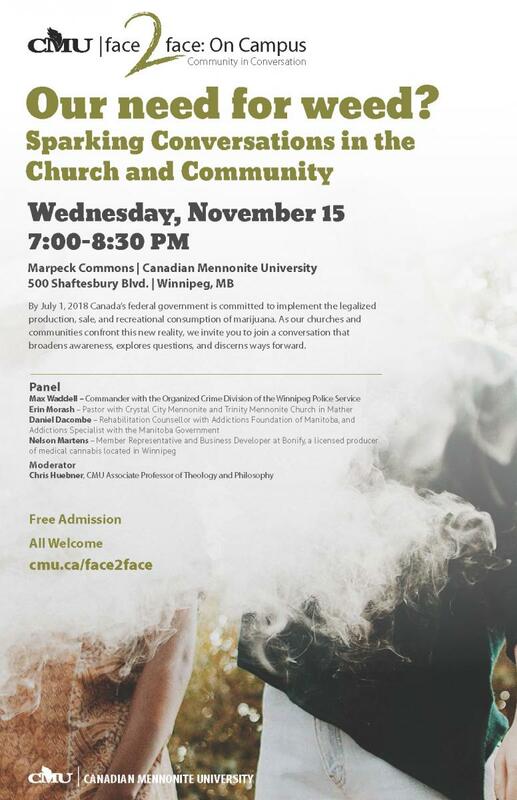 Started in 2013, Face2Face is a series of conversations organized by CMU, designed to engage the community on a wide variety of current events and issues at the intersection of faith and life. “Our Need for Weed?” is the first of two Face2Face events CMU is scheduled to host during the 2017-18 school year. For details, visit cmu.ca/face2face.